“As a technology company, it’s our mission to design products that are truly unique and innovative such as SWITCHEX,” said Jim Puchbauer, Elemental LED’s VP of Strategic Alliances. Elemental LED, a leading U.S. based engineering and technology company that manufactures LED lighting solutions, announced today a strategic partnership with Nora Lighting to meet the growing demand for the innovative and award winning SWITCHEX®, the first combination LED driver and LED dimmer switch. Elemental LED and its manufacturing and wholesale division, Diode LED, provides a wide variety of superior quality linear, task, and accent LED lighting solutions for both commercial and residential applications. The strategic partnership reflects a synergy of philosophy in regards to the customer experience. Nora Lighting and Elemental LED have a shared commitment to delivering exceptional services and the best solutions in the market to respective customers and this shared vision is the foundation of the partnership. The patent pending SWITCHEX®, recent winner of the Architectural SSL Product Innovation Award (PIA), is a stylish, one-of-a-kind product that combines an LED dimmer switch and LED power supply into a single integrated unit. The SWITCHEX integrated Dimmer-Driver accepts 120 Volt AC and converts it to low voltage DC, all within a standard electrical box. With power options up to 100W, it is a true evolutionary step forward for power and control of LED applications. Customers are no longer required to purchase a separate LED power supply and a dimmer switch to power and control low-voltage LED lighting. Now, with fewer components, a stylish, simplified installation with excellent dimming performance is possible. Nora Lighting will immediately begin to carry SWITCHEX in their product portfolio helping their customers solve two of the most common challenges with LED lighting installations. 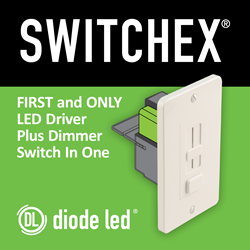 SWITCHEX eliminates the poor dimming performance that results from mismatched dimmer switches and LED drivers from different manufacturers, and offers a simplified installation in a standard electrical box. No more issues with finding a place to fit the driver. Elemental LED is proud to have designed SWITCHEX to solve the many challenges faced by customers today. SWITCHEX is the only solution for low voltage LED control that provides excellent dimming performance, easy installation and flawless driver and switch compatibility. More information on SWITCHEX can be found at http://www.DiodeLED.com/switchex and at http://www.noralighting.com/switchex.aspx. Elemental LED is a leading North American based engineering and technology company with offices in California and the United Kingdom. We manufacture an extensive high-quality portfolio of lighting, power supplies, and controls. We specialize in superior patented linear, accent, and task LED lighting featuring unparalleled CRI and R values with flawless, and vibrant high-fidelity color rendering. We are proud to be America's largest provider of low voltage linear LED lighting, inspiring lighting professionals with our innovative technology, unmatched quality, and best-in-class customer experience. Nora Lighting is among the lighting industry's leading designers and manufacturers of innovative and energy-saving recessed, track, rail, linear, undercabinet, pendant, and exit and emergency lighting fixtures for commercial and residential applications. Nora Lighting’s commitment to utilizing the highest quality and most technologically advanced materials in all of its LED lighting fixtures, as well as its family of incandescent, fluorescent, and HID fixtures, goes hand in hand with Nora Lighting’s exceptional value and commitment to providing superior service to its customers across North America.